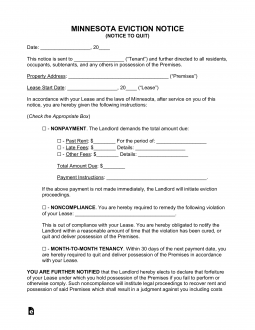 The Minnesota eviction notice forms are used to inform a tenant that landlord is giving them notice of a potential eviction action, either for failure to pay rent or some other breach or because the month-to-month tenancy term will expire in thirty days and tenant needs to vacate the property by then. In Minnesota, a landlord may seek eviction if the tenant fails to respond to the notices by going to the Local District Court (in Hennepin and Ramsey counties, you should go to the local housing court) and file a Complaint (Form HOU102) and Summons. The landlord will then have to seek to have the tenant served with the summons and complaint by a process server. The hearing will be held within seven to fourteen days at which point the parties will present their cases. If the landlord prevails, the court will issue a writ of recovery which will allow a sheriff to remove the tenant with 24 hours notice. 14-Day Notice to Quit (Non-Payment of Rent) – This notice is used by the landlord to let the tenant know that rent is due and that they have 14 days to pay before landlord will file an eviction action. 30-Day Notice to Quit (Month to Month) – This form is used to give notice of the end of a month-to-month tenancy. *Non-Compliance – There is no Statute against a lease violation. Therefore the landlord is advised to notify the tenant on their own terms and if they do not comply they are allowed to seek a legal eviction. In Minnesota, rent is due on the date specified in the lease and if it is not paid, landlord may seek to evict the tenant for non-payment of rent. However, a tenant can “pay and stay” even up to the hearing date as long as the tenant pays the full amount owed, plus landlord’s costs to bring the eviction action. Step 2 – If the tenant fails to respond in a satisfactory manner and continues to live in the premises, landlord may go to the Local District Court (in Hennepin and Ramsey counties, housing court) and obtain a summons and Complaint (Form HOU102). Fill the forms out as directed, pay the requisite fee and make a copy for each tenant. The court will provide a hearing date. Step 3 – Obtain the services of a process server to serve the Summons and Complaint on the tenant at least seven (7) days before the hearing date in accordance with 504B.331. The tenant will have the right to defend themselves and file the Answer (Form HOU202) before the trial date. Step 4 – The landlord will have to file evidence of service of the tenant(s) at least three (3) days before the hearing. Step 5 – In the event the landlord obtains a judgment in his or her favor, tenant will have to vacate. If the tenant fails to vacate, landlord may apply for a Writ of Recovery of Premises and Order to Vacate in order to have a sheriff move the tenant out. The Landlord Tenant Rental Agreement or Lease this Notice will concern itself should be reviewed and readily available when it is time to fill out this form. Any part of this form requiring Lease information will require it to appear exactly as it does on the Property Lease Agreement signed by the Lessor and Lessee. The required form may be obtained directly from this page by selecting the PDF, ODT, or Word buttons. You should have an appropriate program at your disposal or be prepared to Print then fill out the document. You may download as many types of this document at your discretion. The initial blank space, just below the form’s title, requires the Recipient’s Full Name to be filled in. You will need to solidify which Leased Property is being referred to. The first paragraph will contain several blank spaces requiring definitions to be made. Define the Leased Property’s City, County, Zip Code, Building Number/Street, and Apartment Number across the blank spaces in the first sentence (in that order). You will also need to solidify the Lease Agreement involved with this Notice. Do this by defining the Calendar Date, Month, and Year across the blank spaces in the second statement. In the area below the words “Check Appropriate Box,” you must make a mark in the checkbox corresponding to the Notice Statement that must be delivered to the Recipient of this document. The “Nonpayment” Notice applies when issuing 14 Days’ Notice to a Tenant who must pay an Authorized Agent or the undersigned a specific amount of money for a Rental Period requiring payment. You will need to fill in the Name of the Authorized Agent, the Amount Due, the Minimum Amount Due, and the Rental Period that must be paid. The “Noncompliant” Notice applies when issuing a Notice to a Tenant who must immediately comply with the Lease Terms he or she has violated. Report the exact nature of the Recipient’s violation on the blank line in this sentence. The first “Month to Month Tenancy” Notice applies when a Landlord is issuing a Tenant Thirty Days’ Notice that his or her Month To Month Lease will expire on the Date. You must enter this Date using the spaces in this sentence. This Date must be at least Thirty Days after this paperwork has been received by the Addressee. The second “Month to Month Tenancy” Notice applies when a Tenant is issuing a Landlord Thirty Days’ Notice that his or her Month to Month Lease will expire on the Date that is entered using the blank spaces in this sentence. The Date of Expiration must be at least Thirty Days after the Landlord has received this paperwork. The Deliverer of this paperwork will need to fill in the “Certificate of Service” section when Delivery is made. This will require the Delivery Date and Recipient to be filled in appropriately on the blank spaces in the statement provided. Below this, he or she will define how this paperwork was delivered. This will be done by checking the first checkbox for a successful first-party delivery to the intended Recipient, the second check box will indicate a successful second party delivery, while the third checkbox will indicate this paperwork was mailed First Class Mail.